Tufts University is part of a seven-university team that received a $15 million NSF award to create the first practical quantum computer. Tufts ‘ associate professor of physics and astronomy in A&S, Peter Love, will lead the team developing applications to run on the new quantum system. From codebreaking to aircraft design, complex problems in a wide range of fields exist that even today’s best computers cannot solve. To accelerate the development of a practical quantum computer that will one day answer currently unsolvable research questions, the National Science Foundation (NSF) has awarded $15 million over five years to the multi-institution Software-Tailored Architecture for Quantum co-design (STAQ) project. 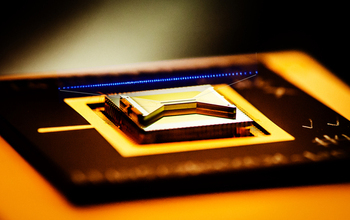 The award is part of the Software-Tailored Architecture for Quantum co-design (STAQ) project, which aims to demonstrate a quantum advantage over traditional computers within five years of using ion trap technology. The project is part of a larger initiative, “The Quantum Leap: Leading the Next Quantum Revolution“, and is “One of NSF’s 10 Big Ideas”. The initiative aims to accelerate innovative research and provide a path forward for science and engineering to help solve one of the most critical, competitive and challenging issues of our time. Researchers will design, construct and analyze new approaches to quantum computing and test algorithms at a scale beyond the reach of simulations run on classical computers. Quantum research is essential for preparing future scientists and engineers to implement the discoveries of the next quantum revolution into technologies that will benefit the nation.